TV Mys-Bomans and RAUM architects designed the partially new building for Hotel Min in the Seefhoek neighbourhood in Antwerp. * This psychiatric care home offers its residents the opportunity to learn everyday domestic skills in a controlled environment at the heart of a lively working-class district. In this way the architectural and spatial setting form an important medium for contemporary forensic care. The previous history of Hotel Min was set in the framework of the Bond zonder Naam which, in addition to the Min Workshop, also started up a reception home for ex-prisoners and vagrants in 1973. In 2001 this non-profit organisation was converted into a psychiatric care home (PVT) as part of the structure of the OPZ Rekem public psychiatric hospital – remotely located in the east of Belgium. Hotel Min currently operates as a link in a forensic care circuit that stretches from the prison and the forensic department of the hospital to sheltered housing and forensic home care. Hotel Min allows its patients to resume everyday activities at home and work in a controlled environment over a period of 6 to 9 months. The aim is to enable the patient to work towards an independent way of life that society no longer experiences as disruptive and dangerous. The partially new building provides a sheltered home with a capacity of 24 residents, one of the places being for immediate admission. The target group currently comprises mainly male patients in internment and on conditional discharge. In addition to the usual search for suitable medication and the identification of the chain of offences, the patients will also be taught essential domestic skills. It involves a varied package of administration, medication, language skills, employment, leisure activities, hygiene, cooking, table manners and so on. The patient is allotted a personal supervisor who constantly evaluates the division and activities of the day and reports at set intervals to the relevant judicial authorities, the Commission for the Protection of Society or the Punishment Enforcement Court. Its spatial setting in the middle of the Seefhoek area is essential for the supervised and controlled return to society that is Hotel Min’s objective. It enables the patient to start the reintegration course as close to the roots as possible. What is more, the forensic care programme is able to link up with other initiatives in the neighbourhood, such as the activity centre ‘t Lokaal and the Min Workshops. The residents can carry out the obligatory labour from 9 am to 4 pm in these centres. An additional advantage is the larger absorption capacity of working-class neighbourhoods in major cities by contrast with residential and rural settings. The varied mix of inhabitants and urban amenities also offer a great many possibilities when it comes to leisure activities. In this way the patient’s ability to function in society can be discretely charted by the supervisory bodies and adjusted when necessary. The embedding of the forensic care was strengthened by linking the building programme to a new home for the De Wijk community centre and the demolition of the adjoining corner houses to achieve this. De Wijk is now no longer enclosed inside the street block on Willy Vandersteenplein, but is a visible presence in Lange Scholierstraat. Although the two organisations function independently, for many residents of Hotel Min the community centre is the first step they take towards community life. This interaction is accentuated by the large internal window in the hall on the first floor that looks out over the foyer of De Wijk. The inverse hierarchy between the care programme and the community centre is repeated in the architectural design. At street level, the opened up corner of the complex, with its glass façade and enlarged letters, functions as a striking signboard that demands all one’s attention. Next to it, the care home is given a plain, rather introverted façade characterised by the repetition of window openings, the simple wooden façade cladding and the modest entrance porch – which deliberately does not even have a name-board. At street level, Hotel Min appears like an anonymous attachment to De Wijk, not as a clinic specialising in forensic psychiatry. Hotel Min’s appearance as a normal building is important for the passer-by, but above all for the patients. Hotel Min is intended expressly to create a virtually normal living environment where patients can master everyday domestic activities. In this regard, the patient is referred to as a resident or guest. The residents are not treated, but are subject to certain measures that enable them to function as normally as possible. A clinical atmosphere would not only be inappropriate, but would undoubtedly have the wrong effect. For this reason, the forensic care home is marketed expressly as a hotel in contrast to its official, coded name: PVT For Min. In order to further extend the metamorphosis from forensic care home to hotel, only the concrete structure and lift shaft of the old building were retained. The 1973 building was worn out and the rooms no longer met prevailing standards either. They were in most cases smaller than the prescribed 12 m² floor area and only had foldaway beds. The extension meant that, in the new complex, the vertical circulation is at the heart of the hotel, whose third floor was the centre of operations. On one side of the lift and stairs are the individual rooms (8 per floor) and several utility rooms (pharmacy, bathroom, linen cupboard) in artificially-lit hotel corridors. On the other side of the stairs are the communal rooms (dining room, kitchen, living room, gym) which are above De Wijk. Wraparound strip windows on the corners provide the communal areas with plenty of light and a good view of the neighbourhood. The second circulation system consists of the external staircase that circles round the building, connecting together the various terraces up as far as the roof. This possible architectural walk through the building is linked to the architects’ aim of enabling a closed building (Hotel Min operates a curfew) to function in its own right as a piece of the urban fabric with internal alleyways, stairs and terraces. The walking route starts on the terrace outside the living room on the ground floor, which serves as a public room for guests, since in principle everyone who has ever been a guest at Hotel Min is always welcome. The end-piece is the roof terrace, which has a broad panorama of the urban surroundings and was adorned with a striking work of art that confronts the guests of Hotel Min with the temporary nature of their stay there. 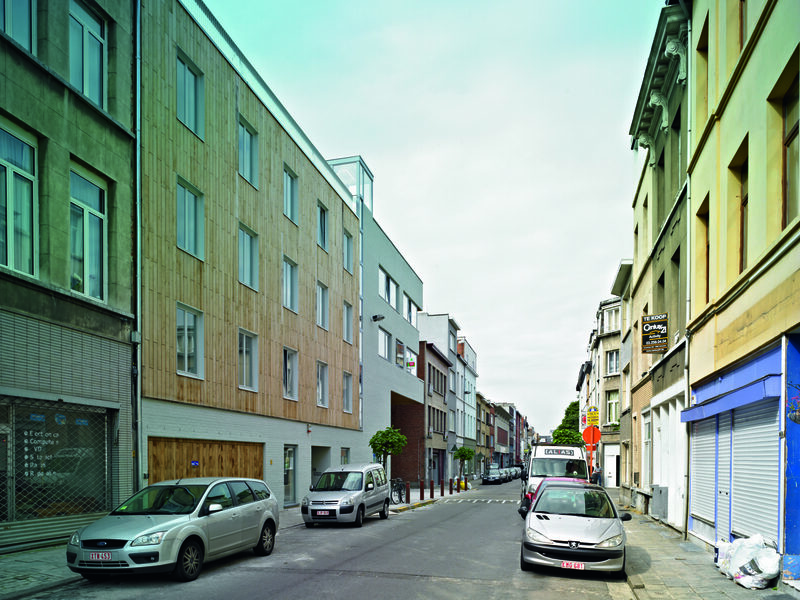 * The assignment to TV Mys-Bomans & RAUM Architects happened through the mediation of the Flemish Government Architect.